Mountain warfare refers to warfare in the mountains or similarly rough terrain. This type of warfare is also called Alpine warfare, after the Alps mountains. Mountain warfare is one of the most dangerous types of combat as it involves surviving not only combat with the enemy but also the extreme weather and dangerous terrain. Mountain ranges are of strategic importance since they often act as a natural border, and may also be the origin of a water source (e.g. Golan Heights – water conflict). Attacking a prepared enemy position in mountain terrain requires a greater ratio of attacking soldiers to defending soldiers than a war conducted on level ground. Mountains at any time of year are dangerous – lightning, strong gusts of wind, rock falls, avalanche, snow pack, ice, extreme cold, glaciers with their crevasses and the general uneven terrain and the slow pace of troop and material movement are all additional threats to combatants. Movement, reinforcements, and medical evacuation up and down steep slopes and areas where even pack animals cannot reach involves an enormous exertion of energy. The term mountain warfare is said to have come about in the Middle Ages after the monarchies of Europe found it difficult to fight the Swiss armies in the Alps because the Swiss were able to fight in smaller units and took vantage points against a huge unmaneuverable army. Similar styles of attack and defence were later employed by guerrillas, partisans and irregulars who hid in the mountains after an attack, making it challenging for an army of regulars to fight back. In Bonaparte's Italian campaign, and the 1809 rebellion in Tyrol, mountain warfare played a large role. Another example of mountain warfare was the Crossing of the Andes carried out by the Argentinean Army of the Andes (Ejército de los Andes) commanded by Gen José de San Martín in 1817. One of the divisions surpassed 5000 m in height. Mountain warfare came to the fore once again during World War I, when some of the nations involved in the war had mountain divisions that had hitherto not been tested. The Austro-Hungarian defence repelled Italian attacks as they took advantage of the mostly mountainous terrain in the Julian Alps and the Dolomites, where frostbite and avalanches proved deadlier than bullets. During the summer of 1918, the Battle of San Matteo took place on the Italian front; this battle was fought at the highest elevation of any in the war. In December 1914, another offensive was launched by the Turkish supreme commander Enver Pasha with 95,000–190,000 troops against the Russians in the Caucasus. Insisting on a frontal attack against Russian positions in the mountains in the heart of winter, the end result was devastating and Enver lost 86% of his forces. The Italian Campaign in World War II, Siachen conflict were also large-scale mountain warfare examples. Since the Partition of India in 1947, India and Pakistan have been in conflict over the Kashmir region. They have fought three wars and numerous additional skirmishes / border conflicts in the region. Kashmir is located in the Himalayas, the highest mountain range in the world. The first hostilities between the two nations, in the Indo-Pakistani War of 1947, showed that both were ill-equipped to fight in biting cold, let alone at the highest altitudes in the world. During the Sino-Indian War of 1962, hostilities broke out between India and China in the same area. The subsequent Indo-Pakistani War of 1965 between India and Pakistan was mainly fought in Kashmir's valleys rather than the mountains themselves, although several mountain battles took place. In the Kargil War (1999) Indian forces sought to flush out opponents who had captured high mountain posts. The proxy warfare in 1999 was the only modern war that was fought exclusively on mountains. Following the Kargil War, the Indian Army implemented specialist training on artillery use in the mountains, where ballistic projectiles have different characteristics than at sea level. Most of the Falklands War took place on hills in semi-Arctic conditions on the Falkland Islands. However, during the opening stage of the war, there was military action on the bleak mountainous island of South Georgia, when a British expedition sought to eject occupying Argentine forces. South Georgia is a periantarctic island, and the conflict took place during the southern winter, so Alpine conditions prevailed almost down to sea level. The operation (codenamed Operation Paraquet) was unusual, in that it combined aspects of long-range amphibious warfare, arctic warfare and mountain warfare. It involved several ships, special forces troops and helicopters. 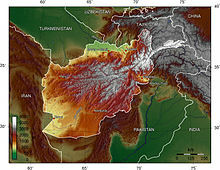 Throughout history but especially since 1979, many mountain warfare operations have taken place throughout Afghanistan. Since the coalition invasion of Afghanistan in 2001 these have been primarily in the eastern provinces of Kunar and Nuristan. Kunar and eastern Nuristan are strategic terrain. The area constitutes a major infiltration route into Afghanistan, and insurgents can enter these provinces from any number of places along the Pakistani border to gain access to a vast network of river valleys. In this part of Afghanistan (Regional Command East), the US military has adopted a hybrid style of mountain warfare incorporating counterinsurgency (COIN) theory, in which the population is paramount as the center of gravity in the fight. In counterinsurgency, seizing and holding territory is less important than avoiding civilian casualties. The primary goal of counterinsurgency is to secure the backing of the populace and thereby legitimize the government rather than focus on militarily defeating the insurgents. Counterinsurgency doctrine has proved difficult to implement in Kunar and Nuristan. In the sparsely populated mountain regions of Eastern Afghanistan, strategists have argued for holding the high ground—a tenet of classical mountain warfare. The argument suggests that if the counterinsurgent does not deny the enemy the high ground, then the insurgents will be able to attack at will. In the Kunar and Nuristan regions US forces continue to pursue a hybrid style of counterinsurgency warfare, with its focus on winning hearts and minds, and mountain warfare, whereby the US forces seize and hold the high ground. The expense of training mountain troops precludes them from being on the order of battle of most armies except those who reasonably expect to fight in such terrain. Mountain warfare training is arduous and in many countries is the exclusive preserve of elite units such as special forces or commandos, who as part of their remit should have the ability to fight in difficult terrain (e.g. the Royal Marines). Regular units may also occasionally undertake training of this nature. Gebirgsjäger is the German word for mountain infantry (Gebirge meaning "mountain range", and Jäger meaning "hunter" or "ranger"). The word Jäger is the traditional German term for light infantry. The mountain infantry of Austria have their roots in the three "Landesschützen" regiments of the Austro-Hungarian Empire. The mountain infantry of Germany carry on certain traditions of the Alpenkorps (Alpine corps) of World War I. Both countries' mountain infantry share the Edelweiss insignia. It was established in 1907 as a symbol of the Austro-Hungarian Landesschützen regiments by Emperor Franz Joseph I. These troops wore their Edelweiss on the collar of their uniforms. When the Alpenkorps came to aid the Landesschützen in defending the Austro-Hungary's southern frontier against the Italian attack in May 1915, the grateful Landesschützen honoured the men of the Alpenkorps by awarding them their own insignia: the Edelweiss. Today the traditions of the Austrian mountain infantry (Gebirgsjäger) are maintained by the 6th Jägerbrigade in Innsbruck, subdivided in three battalions (Jägerbataillon 23, Jägerbataillon 24 and Jägerbataillon 26). Honouring tradition, upon the creation of the Bundeswehr in 1955, the mountain infantry returned as a distinctive arm of the German army. Until 2001, they were organized as the 1st Mountain Division 1. Gebirgsdivision, but this division was disbanded in a general reform. The successor unit is Gebirgsjägerbrigade 23 which has its headquarters in Bad Reichenhall (Bavaria). Battalions of these mountain infantry are deployed in southern Bavaria. The soldiers of the mountain infantry wear a grey cap (“Bergmütze”) with an Edelweiss on its left side. This distinguishes them from all other German army soldiers who wear berets. The formal uniform, which is based on traditional skiing outfits, is also different from the standard German military uniform, and consists of ski jacket, stretch trousers and ski boots. The "Kaiserjägermarsch" ('March of the Kaiserjäger') from 1914 is the traditional military march of the German and Austrian mountain infantry. Brazilian Army mountain warfare training is organized by the 11th Mountain Infantry Battalion, located in São João del Rei (Minas Gerais). They served beside the US 10th Mountain Division in the Italian Apennine Mountains in World War II, fighting at Monte Castello and Montese. 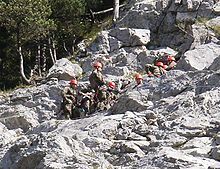 This battalion develops the mountaineering techniques for the Brazilian Army. The Brazilian Mountain Guides serve also. The 11th battalion has troops deployed in Haiti integrating the MINUSTAH. The 11th Battalion offers four courses for all the Brazilian Armed Forces, including the Auxiliary Forces (Military Police and Military Firefighters Corps). Brazilian mountain soldiers wear grey berets and a Brazilian Army camouflaged uniform with reinforced seams. Mountain duties in Brazil are coordinated by the 4th Light Infantry Brigade (Mountain), in Juiz de Fora (Minas Gerais). It covers the 10th Light Mountain Infantry Battalion, 32th Light Mountain Infantry Battalion, 11th Mountain Infantry Battalion, 4th Mountain Artillery Group, 17th Mountain Logistic Battalion, 4th Mountain Cavalry Squad and the 4th Mountain Communications Company. Bulgaria's 101st Alpine Battalion (Bulgarian: 101-ви алпийски батальон), based in Smolyan, is currently the only Bulgarian unit specialized in mountain warfare. A unique feature is their armament – Mosin–Nagant rifles, which were selected due to their excellent performance in high-altitude warfare. The battalion also has portable 60-mm mortars. The unit is experienced in the terrain of the Rhodope Mountains, and during the Cold War it trained extensively for operations against Greek and Turkish forces. Until 1859, Italy wasn't yet a unified state but a sum of kingdoms and independent republics (Kingdom of Naples, Republic of Venice, Papal States, etc.). The situation changed with the unification of Italy. 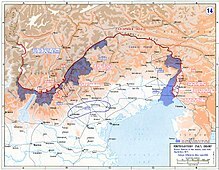 France saw this geopolitical change as a possible threat from the other side of the Alps border, partially as the Italians were the first to raise a corps of mountain warfare troops: the Alpini. The French solution was to create its own mountain corps in order to oppose a possible Italian invasion through the Alps. By December 24, 1888, a law created a troupes de montagne ("mountain troops") corps. Of the 31 existing Chasseurs à Pied ('Hunters on Foot') battalions, 12 were selected to be converted. These first units were named Bataillons Alpins de Chasseurs à Pied ('Alpine Battalions of Hunters on Foot'), later shortened to Bataillons de Chasseurs Alpins ('Alpine Hunters Battalions'). All three battalions are based in cities in the French Alps, thus the name of the units. The Chasseurs are recognised by their wide beret (when not in battle uniform), named tarte ('pie'). The British Army adopted the beret in the 1920s after having seen similar berets worn by the 70th Chasseurs Alpins (now disbanded). Other mountain troops in the French armed forces comprise artillery (currently the 93rd Mountain Artillery Regiment) light armoured cavalry (4ème Régiment de Chasseurs), the 2nd Foreign Engineer Regiment (2ème REG) and the 2nd Company of the 2nd Foreign Parachute Regiment. The Gendarmerie Nationale has its own mountain units: PGM (Peloton de Gendarmerie de Montagne) and PGHM (Peloton de Gendarmerie de Haute Montagne) devoted to mountain rescue and law enforcement. Georgia, located in the Lesser Caucasus and dominated by rough and mountainous terrain, has a long history of mountaineering. Engagements involving Khevsurian highlanders and various partisan wars date back at least to the Early Modern Period, as well as border wars of the early 20th century. Soviet Georgian mountain troops played a role in preventing Axis troops from crossing the Caucasus Mountains during the Battle of the Caucasus in World War II. In June 1991, the year Georgia declared independence, the 16th Mountain Battalion was formed at Sachkhere, succeeding the Sachkhere Battalion. The 16th Battalion participated in all of Georgia's 1990s territorial conflicts, with 21 soldiers killed in the line of duty. The actual school itself was officially established in 2006 on the basis of a training-and re-training school from two years earlier in cooperation with French counterparts. Georgian instructors since then train and are being trained by French instructors in a 3-year program, the school earning several awards and certificates among them a status as NATO training center to train instructors and troops from other nations, including NATO members such as Germany, Poland, Norway and partner countries. The Mountain Warfare School is also responsible for providing training to Georgia's own and its neighbouring countries' elite troops as well as law enforcement and counter terrorism units. For conflict and special emergencies, the school itself fields a company-strong force, which is regarded as one of the most elite units in the Georgian army. Each brigade's reconnaissance units that are also generally considered elite have been trained in mountain warfare. However the largest and more recognised formation specialised in that particular area is Georgia's Special Mountain Battalion, part of the country's special forces. In a more harsh manner the brigade's Special Forces Group exercises mountain and alpine warfare. The Indian Army has fought numerous conflicts in the Himalayas in Arunachal Pradesh and Jammu and Kashmir, while maintaining one of the largest active contingents of mountain warfare forces in the world. Major conflicts include the 1962 Sino-Indian War and the Kargil War in 1999. Siachen Glacier is the world's highest battlefield, with about 3000 Indian troops on year-round deployment on the edge of a glacier. For over two decades, India and Pakistan have fought numerous skirmishes in this most inhospitable of mountain territories, at altitudes over 6,000 metres (20,000 ft) and at temperatures as low as −50 °C (−58 °F). Due to the instability in the region and the need for permanent deployments in the mountainous regions, India's mountain warfare units were expanded after the 1962 war, with the creation of six mountain divisions. The Indian Army presently has ten divisions dedicated to mountain warfare (eight mountain divisions and two mountain strike divisions) and another infantry division earmarked for high altitude operations. Each division has a personnel strength of 10,000–13,000 troops and consists of three brigades with 3,000 to 4,500 men each, including support elements such as signals, provost, and intelligence units. In 2008, the Indian Army sanctioned plans to raise two additional mountain divisions, with goals to be operational within five years. The two divisions were to have extensive air assets, including utility helicopters, helicopter gunships and attack helicopters. The Indian Military Academy (IMA), Dehradun conducts preliminary mountaineering and mountain warfare training for all Officer Cadets. Discontinued in the late 1980s, the Bhadraj Camp was revived in 1999 after the Kargil War. The culmination is a course of a 40 km run and climbing a 5500-foot cliff with a fully loaded pack at night. For more specialized training, the Army operates the Parvat Ghatak School (Hindi: पर्वत घातक, Mountain Strike or Mountain Warrior) at Tawang, Arunachal Pradesh. This high-altitude commando school is the highest of its kind at 15,000 feet, with the mercury dipping to minus 20 degrees, providing a freezing tougher terrain to impart training in conditions similar to Siachen. Another school, the High Altitude Warfare School (HAWS) is located near Gulmarg, Jammu and Kashmir. Set up in 1948 as the 19 Infantry Division Ski School, HAWS has over the years become the Indian Army's nodal center for "specialised training and dissemination of doctrines" in high-altitude, mountain and snow warfare. HAWS Mountain warfare courses are conducted in the Sonamarg area, and snow-craft & winter warfare training in the Gulmarg area. HAWS played an important role during the Kargil War by conducting crash courses for troops prior to their deployment. Given the experience of the Indian Army in mountain warfare, troops from other nations regularly train and conduct joint exercises at these schools. Because of its experience in fighting wars in mountain regions for over 50 years, as well as its history of recruitment of natives from the Himalayan regions of India and Nepal (such as Gurkha, Kumaon, Garhwal and Dogras), Indian Mountain Warfare Units are considered among the best in the world[according to whom?]. Numerous army units across the world are now implementing training modules modeled after Indian Mountain Warfare training systems. These include forces from UK, US, Russia, Israel, etc. In 2004, US special forces teams were sent to India to learn from Indian Army experiences of the Kargil War prior to their deployment for operations in Afghanistan. Russian troops also trained at the High Altitude Warfare School in Gulmarg for operations in Chechnya. They also visited Siachen and other Army posts. The Alpinist Unit is the Israeli mountain unit. Unlike most of the Israeli Defense Forces, the Alpinists are composed of volunteers, trained after their standard service time, no younger than 22–23. The Alpini (singular: Alpino) are the elite mountain warfare infantry of the Italian Army. They are currently organised in the Julia and Taurinense alpine brigades, which are subordinated to the Alpine Troops Command. Formed on October 15, 1872, to protect Italy's northern mountainous borders, the "Alpini" are the earliest active elite mountain warfare infantry in the world. On June 7, 1883, the Alpini were awarded the fiamme verdi ('green flames') collar patch, thus elevating them to a speciality within the Italian Infantry Corps. Also adopted was their distinctive headdress; the Cappello Alpino with its black feather, which led to them being nicknamed Le Penne Nere ('the Black Feathers'). They distinguished themselves during World War I as they fought against Austro-Hungarian soldiers in what has since been called the "War in snow and ice". During World War II, the Alpini fought mostly on the Eastern Front being tasked to hold the front in the Don river plains. In the 1990s, after the end of the Cold War, three of the five Alpini brigades and many support units were disbanded due to the reorganization process of the Italian Army. Currently, despite having some of the best trained and best equipped mountain troops in the world, the military role of Alpines is seen in terms of peacekeeping missions and minor disputes interventions. The 4th Alpini Parachutist Regiment is a special operations unit specialising in airborne assault, comparable to the United States Army Rangers. It originated from the Alpini paratrooper platoons in each of the five Alpini brigades, which were merged on 1 April 1964 in the Alpine Paratroopers Company. The Centro Addestramento Alpino Aosta is the Army's school responsible for the mountain training of its troops. The 6th Regiment is based in Innichen in the province of South Tyrol and directly subordinated to the Alpine Troops Command (COMALP). It functions as a NATO-wide high altitude warfare training centre and administers the Training Areas in the Puster Valley. In the Pakistan Army, mountain training is considered part of overall training and all soldiers and units are expected to be proficient at it. Almost all units of all arms serve tours in Kashmir (Pakistan administrated Kashmir) and Northern Areas, often in active duties on the Line of Control or Siachin. The Army's High-Altitude School, at Rattu in Pakistan administrated Kashmir, is an ideal location on the confluence of the Hindukush, Himalayas, and Karakorum ranges. The school conducts training throughout the year and includes mountain climbing on peaks ranging from 15,000 to 20,000 feet and survival on glaciated terrain and in snowy and icy conditions. The Podhale rifles (Polish: strzelcy podhalańscy) is a traditional name of the mountain infantry units of the Polish Army. Formed in 1918 out of volunteers of the region of Podhale, in 1919 the smaller detachments of the Podhale rifles were pressed into two mountain infantry divisions, the 21st Mountain Infantry and 22nd Mountain Infantry Divisions, as well as into three brigades of mountain infantry. The units were roughly equivalent to the German Gebirgsjäger troops. Currently the Polish Army maintains one brigade of mountain infantry. The Vânători de Munte ("Mountain Hunters/Rangers", Romanian pronunciation: [vɨnəˈtorʲ de ˈmunte]) are the elite mountain troops of the Romanian Land Forces. They were first established as an independent corps in 1916 during World War I, and became operational in 1917 under the Corpul de Munte designation. The Vânători de Munte saw action in World War II on the Eastern Front in some of the harshest battles, including Sevastopol and Stalingrad, where their performance lived up to their reputation: virtually all their commanders from brigade level and up received the Knight's Cross of the Iron Cross. There are currently two operational brigades, one subordinated to the 1st Territorial Army Corps (the 2nd Mountain Troops Brigade), and another to the 4th Territorial Army Corps (61st Mountain Troops Brigade). Mountain troops are participating in peacekeeping missions in Afghanistan. Mountains constitute almost half the area of Sweden, including its northern border. Winter and mountain warfare skills were therefore always important to the country. Between 1945 and 2000 Sweden trained and deployed several companies per year at the Army Ranger School and later the Lapland/Arctic Mountain Ranger regiment (I22) in Kiruna (located some 150 kilometres north of the Arctic Circle in Lapland). The school/regiment drew on experiences gained during World War II from guarding and patrolling the mountainous northern borders and uninhabited inland mountain regions, as well as from light infantry and ski fighting in Finland in the wars against the Soviet Union. Later the army as a whole benefited from the Army Ranger School, as commanding and training officers as well as complete fighting units undertook training there. Exchanges were also organised with similar units in, for example, Finland, Norway, Germany, Austria, Switzerland, France, the UK, and the USA. As part of major armed forces reductions in 2000, the Lapland ranger regiment (I22) in Kiruna was disbanded, and its several trained and equipped battalion and company sized field units were deactivated. More recently the army has created a dedicated mountain platoon. This is now based at the ranger detachment (known as Arméns Jägarbataljon or simply AJB) in Arvidsjaur (located 100 kilometres south of the Arctic Circle); since AJB is a detachment, it is a part of Norrbotten Regiment (I 19) in Boden. The task for this single battalion is to guide other smaller units in the mountains besides taking on reconnaissance and fighting tasks. The Turkish Army has a mountain warfare specialized brigade (Bolu Commando Brigade) located at the city of Bolu in northwestern Turkey, which actually operates in the province of Hakkari and northern Iraq. The Hakkari Mountain Commando Brigade mostly performs counter-terrorism operations in this extremely rugged region of south-eastern Turkey, with an average elevation of 3,500 metres (11,500 ft) and wintertime temperatures below −30 °C (−22 °F). The officers and soldiers of this brigade as well as other troops are trained in Egirdir Mountain and Commando School in Egirdir, near the city of Isparta. The training and facilities offered by the school are utilized by other members of NATO, and non-NATO countries such as Pakistan, Azerbaijan and some Eastern European countries. Hakkari Mountain Commando Brigade has been at the forefront of counter-terrorism operations against the PKK militant organization since the late 1980s, and has participated in several cross-border operations and incursions into Iraq in hot pursuit of PKK militants. Most recently, in February 2008, the brigade participated in Operation Sun, in which 10,000 Turkish Armed Forces troops entered and temporarily seized Iraqi territory utilized by PKK. The entire operation took place in the region of northern Iraq near the Qandil Mountains in extreme winter conditions. In the United Kingdom the Royal Marines are the principal regular unit trained in mountain and cold-weather warfare and have a specialised instructor cadre: the Mountain Leader Training Cadre. The capability is fielded by 3 Commando Brigade. The British Army also have the Mountain Troops of Special Air Service squadrons. During the Cold War the Royal Marines were assigned to the NATO Northern Flank; their task was to be part of the force defending the mountainous Nordic region from the Soviet Union. The 10th Mountain Division served in the Italian Apennine Mountains in World War II. The Army National Guard has the Mountain 86th Infantry Brigade Combat Team consisting of battalions around New England. In the United States there are four training facilities dedicated to preparing for mountain and cold weather warfare: the Special Forces Advanced Mountain Operations School (SFAMOS) in Ft Carson, Colorado, Army Mountain Warfare School in Jericho, Vermont, the Northern Warfare Training Center in Black Rapids, Alaska and the Marine Corps Mountain Warfare Training Center in Pickel Meadows, California. Netherlands: Mountain Leader Reconnaissance Platoon, Netherlands Marine Corps, and within the Korps Commandotroepen, there are dedicated groups specialized in mountain warfare. Switzerland: there are currently two active and one reserve mountain infantry brigades in the Swiss Army: Brigata fanteria montagna 9, Brigade d'infanterie de montagne 10 (reserve), and Gebirgsinfanteriebrigade 12. Besides those mentioned above: Armenia, China, Russia, and Ukraine are also among the nations that field units specialized in mountain warfare. ^ It is generally accepted that the ratio required for the force launching an offensive to have a good chance of success is 3:1. In mountainous terrain, the required ratio is much more. ^ "Military Power Review – Tropas de Elite – Infantaria de Montanha do Exército Brasileiro". www.militarypower.com.br. Retrieved 2016-09-16. ^ "4ª Brigada de Infantaria Leve (Montanha) prepara-se para atuar nos Jogos Olímpicos Rio 2016 – Noticiário do Exército – Exército Brasileiro". www.eb.mil.br. Retrieved 2016-09-16. ^ Thomas Brady, India Recruiting Six New Divisions; Mountain-Training Pushed, New York Times Archives, 25 March 1963. ^ Outlook India, High School Archived 2006-09-04 at the Wayback Machine, 3 April 2000, on Bharat Rakshak. ^ India, UK forces to conduct anti-terror war game in Ladakh, The Hindu, 19 August 2007. ^ Jawed Naqvi, US lists military deals, special ties with India, The Dawn, 23 August 2004. ^ Indian and Russian Army Chiefs meet Archived 2008-08-29 at the Wayback Machine, FIDSNS, 25 June 2008. ^ "Army High Altitude School". Pakistanarmy.gov.pk. 2009-09-01. Retrieved 2012-07-26. ^ "132nd Mountain Battalion". Slovenskavojska.si. Retrieved 2012-07-26. ^ "Multinational Centre of Excellence for Mountain Warfare". Slovenskavojska.si. Archived from the original on 2012-02-24. Retrieved 2012-07-26. ^ "Brigata fanteria montagna 9". He.admin.ch. Archived from the original on 2012-11-12. Retrieved 2012-07-26. ^ "Brigade d'infanterie de montagne 10". He.admin.ch. 2012-05-12. Archived from the original on 2012-08-17. Retrieved 2012-07-26. ^ "Gebirgsinfanteriebrigade 12". He.admin.ch. 2012-07-11. Archived from the original on 2012-08-05. Retrieved 2012-07-26.